There’s a perception that has survived from the early days of advertising, when executives sipping scotch were certain that half of their marketing spend made them money. They just couldn’t figure out which half. Now of course, we can. With modern sophisticated analytics we have the ability to track almost everything about where and how we spend our dollars, and to make sure that we only spend money when it’s going to grow our business. This includes defining and measuring your mobile app ROI. The best app analytics tools today are rapidly improving to catch up to the more mature web analytics offerings. And in today’s highly competitive app landscape, it’s more important than ever to understand mobile app analytics — and to know from day one of a project what success looks like and how to get there. Here are five steps to getting ROI from your mobile app. First, create a mobile app measurement plan. This is a framework for instrumentation and analysis that is part of — and derived from — your overall mobile strategy. You know what you want your app to achieve, you have put tactics in place to meet those objectives, and now you should be able to measure their success. Identify the strategies and tactics to support the objectives. Choose the metrics that will be the KPIs. Decide how you’ll need to segment your data. Choose your targets for your KPIs. At least some of your KPIs should be measured in dollars, even if they’re not necessarily ecommerce transactions or subscription payments. Whatever your business, you have customers who use your app and at some point they’re going to be a source of revenue. If your app has no obvious revenue source, think about the customer touchpoints where you do derive revenue and outline how your app contributes to them. This is where the intangibles come in. If, for example, a customer has watched three videos using your content-based app and then goes to your website to buy a T-shirt, how much of the sale should you attribute to the app, and how much to the website? All to the app? All to the site? Or somewhere in between? Measuring clear KPIs for your tactics can help make these decisions easier to resolve. The customer lifetime value (CLV, sometimes LTV, even CTLV) shows what you should expect to earn from each user until they stop using your app. There are various ways to calculate CLV depending on your business model and your need for precision, but in general it is a function of how much money you can expect to earn from a given customer and how long you can retain them. Measuring at least some of your KPIs in dollars makes the task of calculating CLV easier. By itself it’s a very handy metric to track; a subscription business could use it for long term forecasting, or you can focus the efficiency of the business by getting more value per user. More importantly, it is key to understanding the value each of your customers offers your business. Of course, what percentage of these costs you allocate to your app is up to you and your particular business model. In some cases, development could be considered a sunk cost and you may only want to include money spent to obtain and retain new customers. In other cases you may want to include everything. Just be transparent about how you calculate these metrics and take that into account when you report them out. The simple thing to do now would be to take the cost per user and compare it with the CLV, but that approach naively assumes that all users cost the same amount to attract and retain. The truth is more complicated. It costs less to onboard a user who came to your app through word-of-mouth than it does to onboard one who installed as a result of an expensive marketing campaign. That doesn’t mean that some installs are free. There are always costs associated with attracting new customers, but it does mean that you need to account for the differences. Some users have a greater CLV than others; it may be that your customers acquired through social media are more loyal than traffic you paid for. It may be the other way round. It’s up to you how deeply you want to dive into this, but at least segment your acquisition channels and derive a cost per install (CPI) for each channel. You could also derive a value on a campaign or ad set level, or even for individual users and do the same for CLV. Don’t forget cross-channel and cross-platform acquisition sources. It may be that it takes multiple touches to persuade a user to install your app. How you attribute costs to those channels matters too. Is it the last touch you’re interested in, the first, or somewhere in between? Choose a model that can help you decide what your CPI is for each touch point. Now you have a more sophisticated analysis of your revenue and costs, you can just subtract one from the other and you’ve got your mobile app ROI, right? Ultimately, measuring your mobile app ROI is a question of knowing where you are and what you need to do to get to where you want to go. Customer needs, trends, and technologies change, so your mobile app development should be an iterative process, too. With a clear measurement strategy in place, you can use the framework to drill into your KPIs to determine what — and how — to improve. For example, you can use mobile app ROI as a guide to see which acquisition channels are best for attracting your customers, or identifying an onboarding funnel that needs some work. Your app ROI is, ultimately, the compass of your mobile strategy. If you track it with an awareness of context, granularity, and meaning, it can help you decide when you are doing things right or when you need to alter your course. 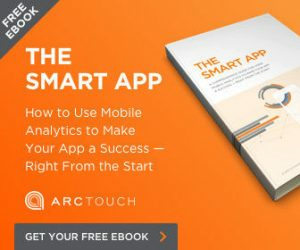 To learn more about mobile app ROI, download our free ebook, The Smart App: A Comprehensive Guide for Using Mobile Analytics to Make Your App a Success — Right from the Start.